On May 1, Class and Component Prices for April were announced. It was a generally favorable month with cheese and butter driving up milk protein and fat prices, as well as Class III milk prices. As will be discussed, the potential international shortage of cheese and butter is causing speculators to bid up current and future values of dairy products. NASS cheese prices, which have the greatest influence on Class III pricing, are now seeing significant escalation. The CME prices lead the NASS prices by about two weeks and are showing even greater strength. 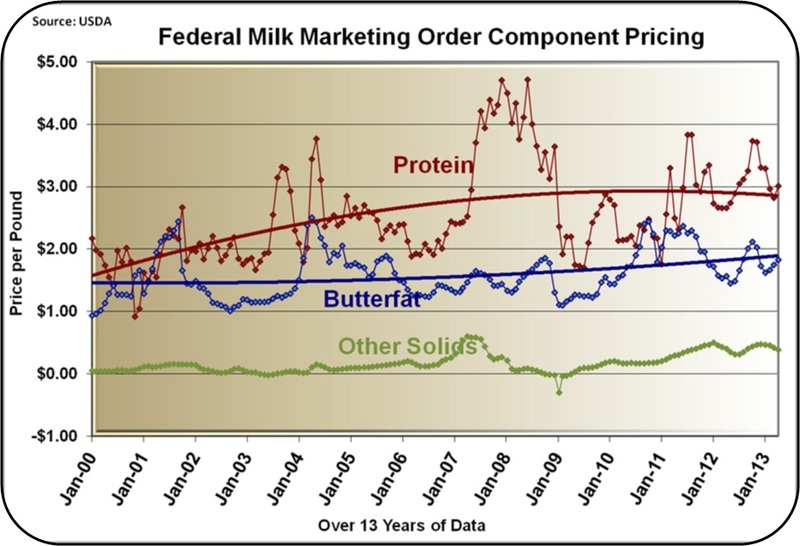 Protein was up the most to $3.01/lb and butterfat went up to $1.82/lb, both excellent prices. Other Solids dropped slightly to $.39/lb. All long term trends continue, with protein being the most valuable component and Other Solids maintaining its higher than historical value. With the increase in protein, the breakdown of the Class III price slightly increased the proportion attributed to protein. In April, from the total of $17.59/cwt, $8.01/cwt was from protein. 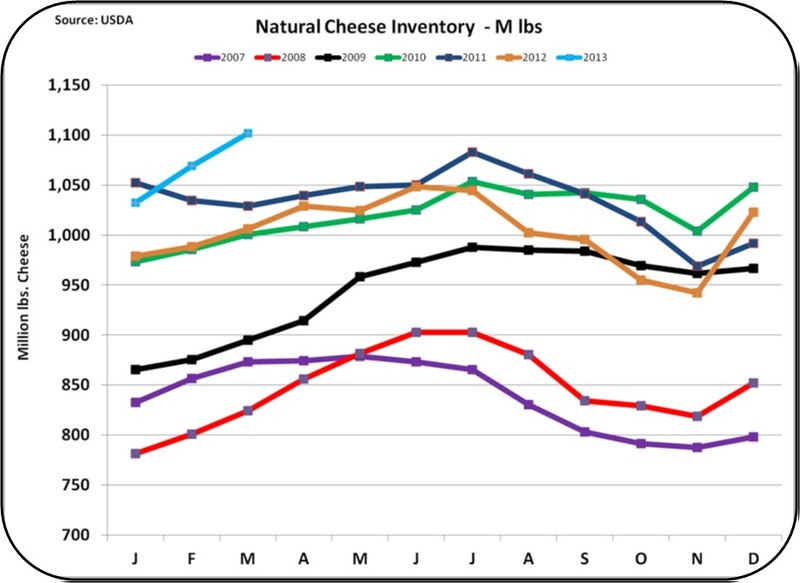 Cheese inventories remain high as of the end of March. 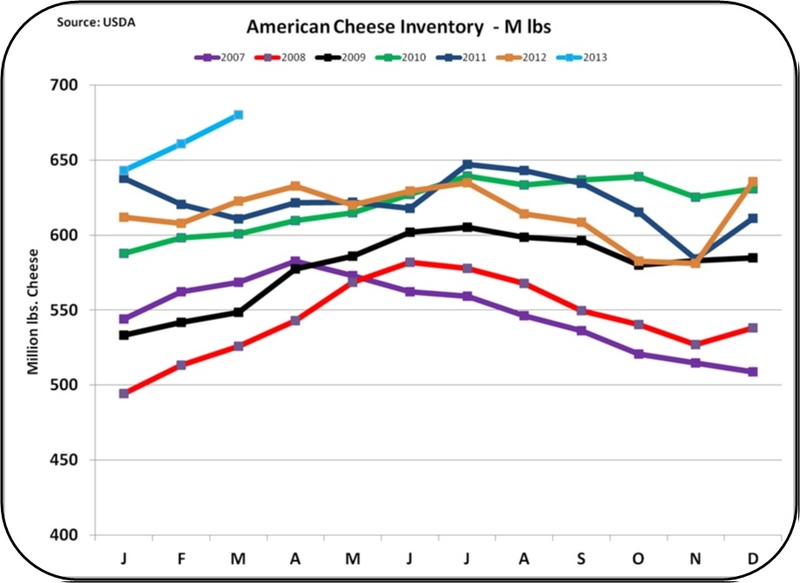 April prices of cheese were up 8 cents to $1.73/lb and they will continue to go up further based on the CME prices. With the inventories still high, prices should be declining. 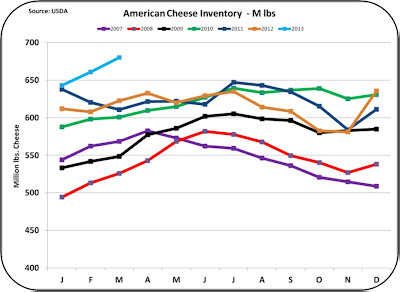 However, because prices are increasing in spite of high inventories, the increase has to be based on the speculation of future increased demand for U.S. cheese. The market for cheese is driven by food processors and speculators. Speculators watch worldwide events and are aware of issues, like the current New Zealand drought, which may limit cheese exports from New Zealand. 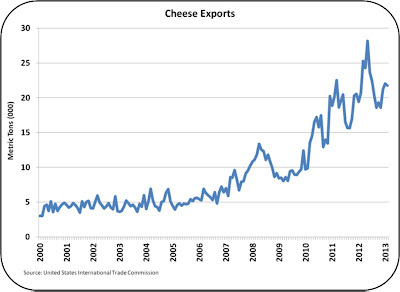 The potential increase in U.S. exports of cheese comes at an opportune time. Domestic consumption is not increasing as it has historically (see last month's blog post on per capita consumption of cheese). 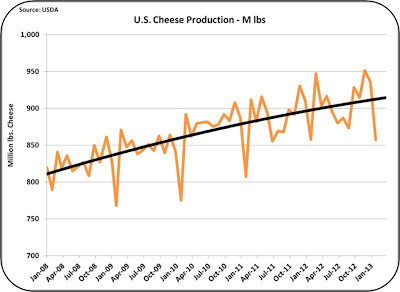 Cheese production was also lower in April, which will also help reduce cheese inventories. 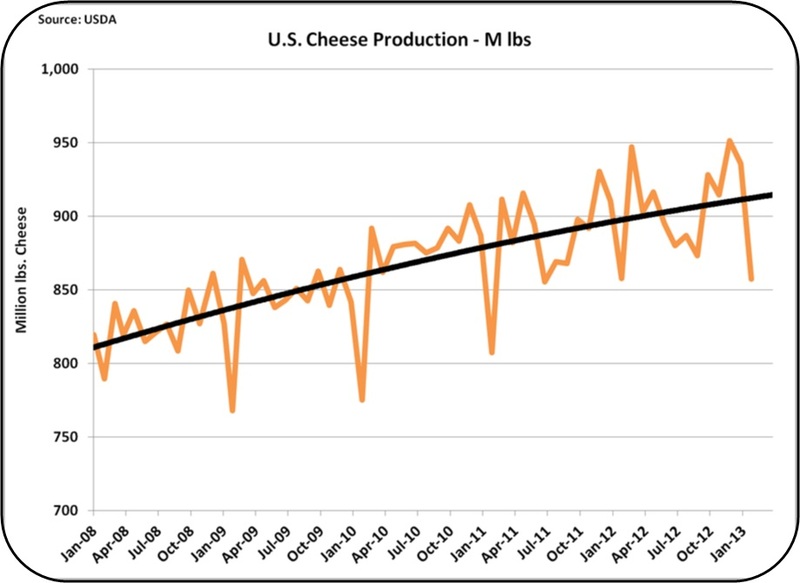 While increased cheese exports are expected, in the most recent reporting periods, this has not yet materialized. Exports are stable, but not increasing. Therefore, the increase in exports is still speculative. 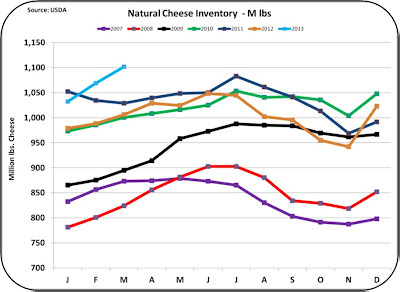 With the potential increase in cheese exports and decreased production, the excess inventories will quickly be diminished. 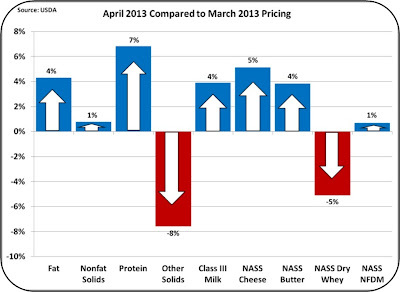 Look for further price increases in cheese, which will inflate milk protein prices and Class III milk prices. 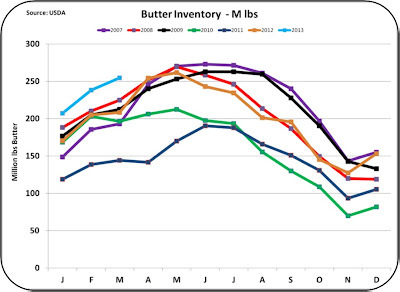 Butter inventories also remain high. Butter prices increased by 6 cents to $1.68/lb. 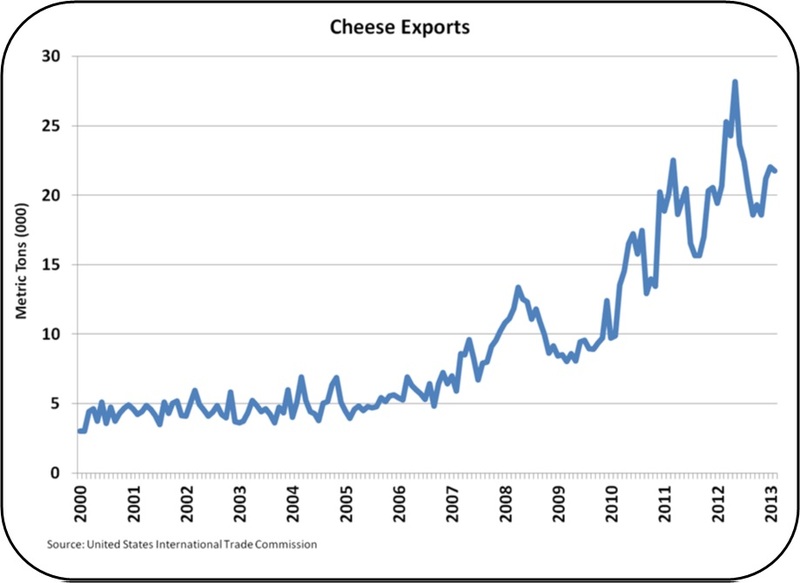 Like cheese, the price increase, at a time of high inventories, can only be driven by speculation of increased exports. 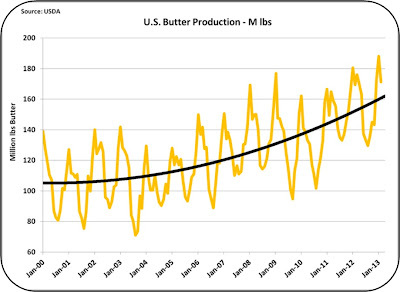 Production of butter remains robust. Considering that domestic consumption increases are minimal and inventories are currently high, the demand for butter must be driven by increased exports. Without these export increases, butter will drop in price. 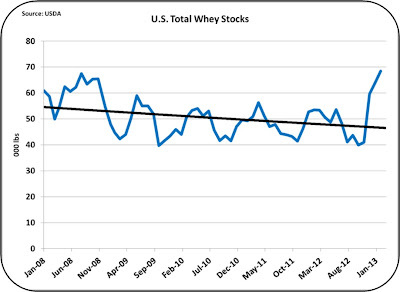 The price driver for Other Solids is the price of dry whey. Whey stocks have been going down for five years, but have suddenly taken a jump. With cheese production down this is unusual. 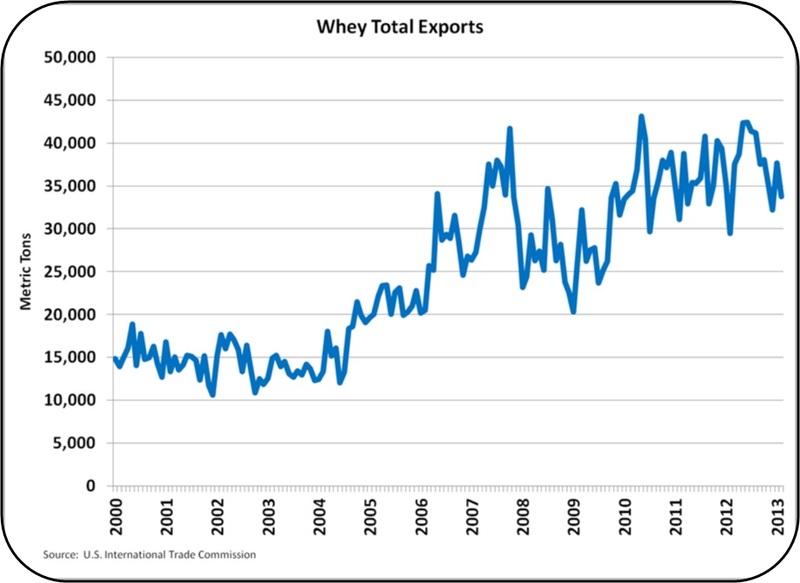 Whey exports are stable, but not increasing. 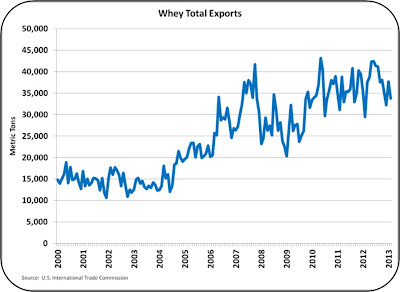 Recognizing that nearly half of all whey is exported, the export market is very important for whey demand. 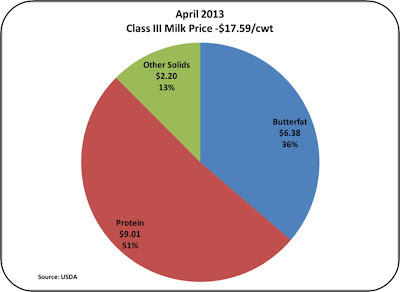 Class III milk futures for the remainder of 2013 are on average around $19/cwt, about 10% above current levels. 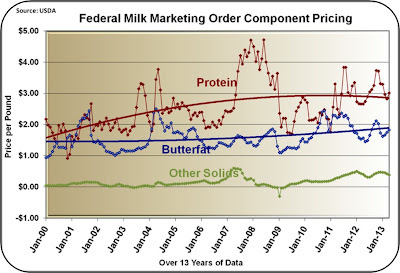 This is primarily based on international demand needing U.S. dairy products. Exchange rates remain favorable for this scenario, so it is most likely these exports will materialize. The changing dynamics will be followed in new posts to this blog.